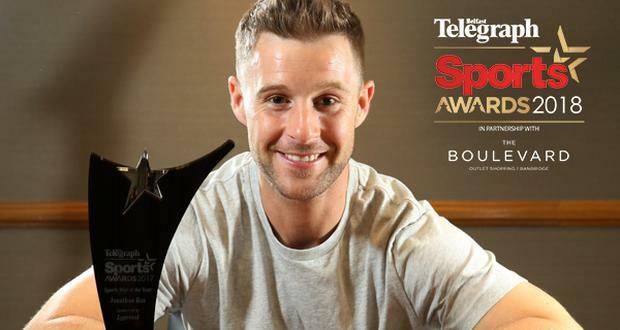 Belfast Telegraph Sports Awards: Nominate your Sports Star Of The Year! Who will follow in the footsteps of previous winners Jonathan Rea, Carl Frampton and Michael Conlon? It’s time to once again celebrate the sporting achievements of teams and individuals across the country with the Belfast Telegraph Sports Awards. Now in its 24th year, this prestigious event will be held in the Waterfront Hall on Monday 14th January 2019, with tickets available here. But first we need you, the sport fans of Northern Ireland, to nominate your favourites across our 13 categories to ensure that your local sporting hero is in the running for a much-deserved trophy! For the first time this year you can nominate your favourites by clicking here. In order to help you decide who to nominate we want to share with you some inspiring stories of previous winners across our categories, starting with the prestigious Sports Star of the Year award which is brought to you by our headline sponsor The Boulevard. Our main award of the night, the Sports Star of the Year award will go to the person whose sporting performances or achievements over the past year are deemed outstanding. This category applies to high performance athletes in both the able bodied and disability spheres. Recent winners have included the likes of Jonathan Rea, Carl Frampton, Michael Conlan and Rory McIlroy. Last year's winner was Rea after his stunning 2017 that saw him win an unprecedented third consecutive World Superbike Championship, winning an incredible 16 races and only finishing outside the podium places at two. Throughout the year, Rea was a fantastic ambassador for Northern Irish sport, both when he competed on the bike and in how he conducted himself outside of the track too. That is what we are looking for in our 2018 winner, somebody who has exemplified what it is to be a Northern Irish sportsman both in what they have achieved, but also in how they represent their country. Indeed, Rea is highly likely to be up for the award yet again this year after he successfully defended his World Superbike title and made it four in a row in 2018. However, there will be plenty of superstars who will be challenging for his title, such as Ireland's Grand Slam winning captain Rory Best, who also led the team to their second win over the All Blacks last week. Ireland women's hockey captain Katie Mullan must surely be up for consideration too after she led her team to an unexpected World Cup final appearance over the summer, as are team-mates Ayeisha McFerran, Megan Frazer, Zoe Wilson, Shirley McCay and Lizzie Colvin. Or how about snooker star Mark Allen, who won his first Masters title in January and then followed that up by winning the International Championship earlier this month. It's also likely that Belfast's James McSorley will also be part of the conversation too after helping Team GB win gold at the wheelchair basketball world championships. Whoever wins the award will join a glittering list of previous winners of our headline prize on the night, with their achievements standing out from the rest of the crowd. Banbridge shopping outlet The Boulevard have this year taken over as headline sponsor of the Belfast Telegraph Sports Awards, and will also sponsor the Sports Star of the Year award. The shopping destination, which is currently undergoing a £7 million rebrand, has introduced a number of other key new brands over the past year including Jack Wills, Kurt Geiger and The Beauty Outlet, with American fashion brand Guess also set to open on 14th December. The new stores have joined a significant selection of other well-loved brands situated within the centre, including Gap, Calvin Klein, Holland and Barrett, Next Outlet and L.K. Bennett. “The Boulevard is delighted to be in partnership with The Belfast Telegraph Sports Awards 2019," commented The Boulevard's centre manager Chris Nelmes. Boulevard has become the ultimate sportswear destination in Northern Ireland.